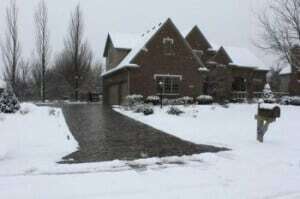 More than one homeowner has seen a driveway that appeared perfectly fine disappear under a blanket of ice and snow, emerging in the spring as a dull, cracked, shadow of its former self. Ideally, asphalt maintenance should be performed year-round, but there are certain steps that can be taken in winter to help prevent damage. • Avoid chemical deicing agents as well products containing rock salt. They may melt through the ice quickly, but their corrosive effects can damage asphalt. Opt for sand or kitty litter instead to improve traction and help expedite melting. • Use a rubber-bladed snow shovel rather than a metal variety. Especially avoid metal shovels that have a pointed tip as they can damage your pavement. • Whether you hire someone to plow your drive or do it yourself, make sure that the blade is set to the correct height. If it is too low, it can scrape the asphalt. • Ensure that your driveway has proper drainage. It is often helpful to remove a two-inch strip of grass along the driveway’s perimeter to facilitate runoff. • Keep gutter spouts pointed away from your driveway. If rain or melting snow is allowed to flow freely onto your driveway, it can freeze. This can pose a safety hazard, but it can also endanger your asphalt. Maintaining your driveway throughout the year can help prevent damages caused by winter weather. Having crack repair as soon as you notice them, and at minimum, have any cracks professionally filled before winter arrives. Cracks allow water to pool beneath the pavement, and then when the water freezes, it can expand and cause additional cracking. Having your driveway sealed in the autumn is another way to protect your asphalt against winter weather. Since 1983, Asphalt Pavement Solutions has been providing a wide range of asphalt services to customers throughout Delaware, Pennsylvania and New Jersey. We offer driveway repair and maintenance, asphalt sealcoating and paving services as well as parking lot services, such as striping, bollards and traffic sign installation. You can use our online form to request a free quote, or feel free to call us at 1.856.461.1710, 1.856.544.3990 or toll-free at 1.800.559.SEAL.